For those who have to have absolutely all games that used the Wolfenstein 3D game engine, this is probably the first Christian FPS game. This was originally created and was the first non-licensed game for the Super Nintendo Entertainment System - and then was converted to run on PC computers. The game designers bought permission from id to remake and slightly alter Wolfenstein 3D. 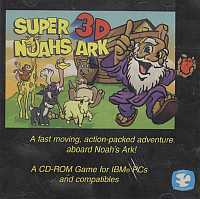 In this game, players assume the role of Noah trying to get his animals back in their pens, as opposed to a soldier trying to hunt down Adolph Hitler. id's original mazes were not altered in design; they used the exact same dungeons. The differences were that they replaced the smooth blue walls with logs to invoke that "in an ark" look. They also did away with the grenades and machine guns and replaced them with a single slingshot that players used to shoot food at animals. Instead of having soldiers that charged at you, then fell in a bloody pool when shot, Super 3D Noah's Ark has little goats that try to kick you with their hind legs and fall asleep with little "Zs" over their heads when you shoot them with food.